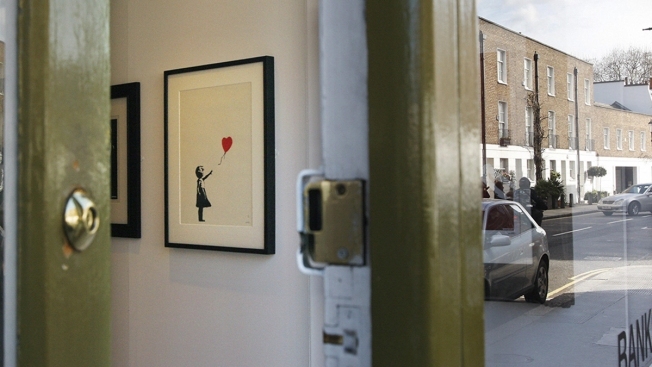 Alex Branczik, head of contemporary European art at the auction house, said: "It appears we just got Banksy-ed"
This Feb. 27, 2008, file photo shows a screenprint entitled "Girl With Balloon" by the artist 'Banksy' at the Andipa Gallery in London. A video was later posted on the account, stating: "A few years ago I secretly built a shredder into a painting in case it was ever put up for auction." The video showed images of a shredder being implanted into a picture frame along with footage of Friday's auction finale. Banksy's spokeswoman, Jo Brooks, confirmed that the post was genuine. Sotheby's — which had noted before the sale that the work's ornate gilded frame was "an integral element of the artwork chosen by Banksy himself" — appeared as shocked as anyone else. The auction house said it was "in discussion about next steps" with the buyer, whose identity was not disclosed. Some art-market watchers say the work could be worth even more in its shredded state. "What he did is really shocking, in a good way," Koukjian said. "I think it will be historic and people will talk for a long time about it." Brooks would not say whether the artist had been at the auction. She said Sotheby's had been "100 percent" unaware of the planned stunt.